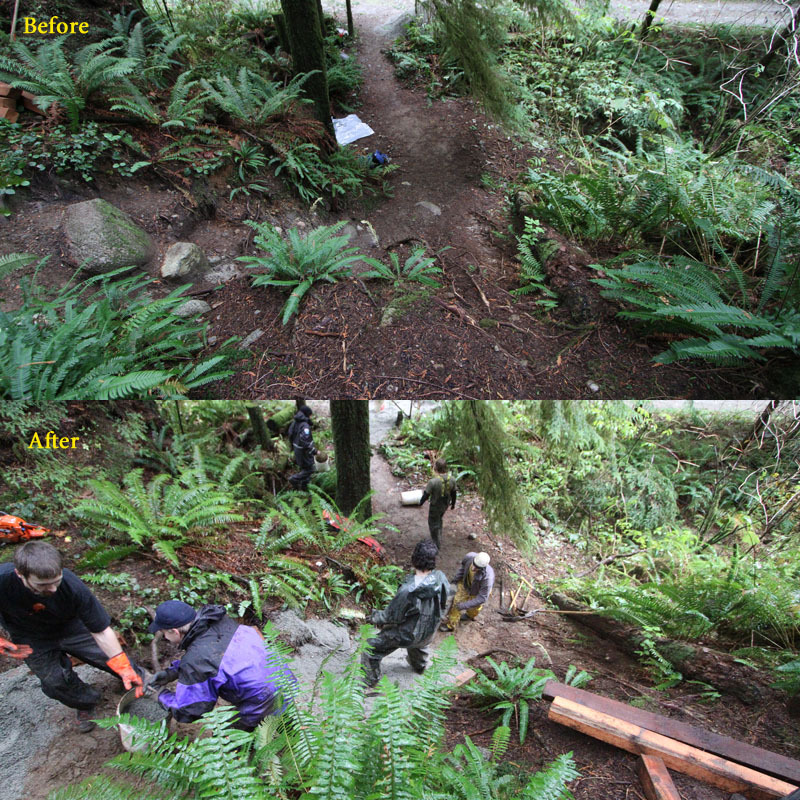 Thanks to the North Shore Bike Fest, Metro Vancouver and the 14 people who came out to work on the bottom section of Circuit 8 trail! Kudo's to Dan and Pete from Ticket 2 Ride who came down from Whistler for a morning of trail work. They've never even ridden this trail! This is an area we would like to see cater to more cross country style riding. A very old trail, the Circuit 8 network has seen some work on the top section by Metro Vancouver. We decided to work on the bottom section to fill in some large ruts and make the trail more in character with the upper section. Thanks to Metro Vancouver for two workers – Carlos and Kristian – and lunch! Everyone fit under the tent, with awesome snadwiches from Tommy's and hot chocolate to boot! The exit of the trail turned sharply right then left with a huge rock in the middle. The section was cribbed and filled in to smooth it out and make an easier exit. Bucket brigade! Darryl, Andrew, Mathew, Vince and Tyler handing buckets up the steep incline. While not evident, the seciton below was a rock garden of small annoying rocks probably brought down from the upper eroding sections during wet weather. Grade reversals were put in the area bordered and raised to create a nice line. The grade reversal cuts across the trail right above the big pile of rocks. Now that nice new gold will stay in place! Another eroded section of exposed roots. The area was filled in and a line defined. 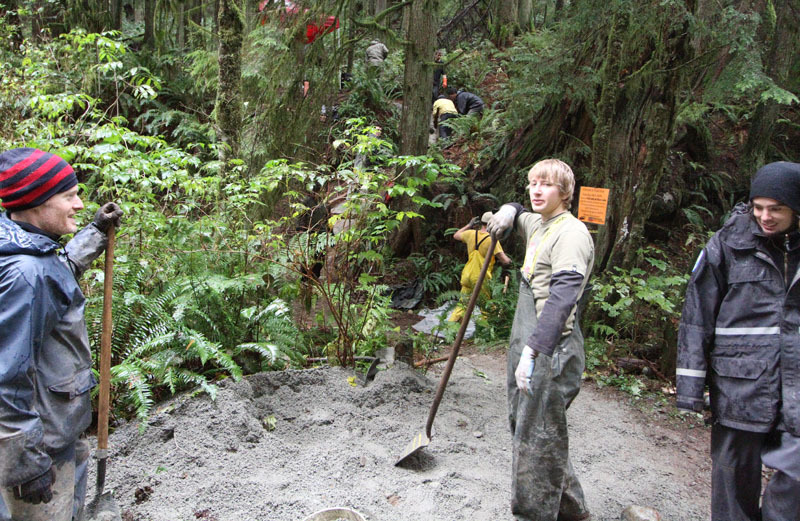 The area above was cleaned up and grade reversals were created to allow water to leave the trail and not run down it. Nasty gnar fest! Notice how deep the trail has eroded into the surrounding bank, and then think about riding this in lycra with your seat jacked to the limit. Lee, Sean, Mathew and Yuri put a grade reversal across the trail, and cribbed, rocked and dirted this section.